For the S&P 500 Index, last week's story was a combination of resistance at the 200-day Moving Average making it unusually sensitive to any negative fundamental news and that arrived Thursday on a report of declining German exports, resulting in a revised lower Eurozone growth forecast. The combination created a gap lower opening that ended the short-term uptrend from the December 26 low, thereby increasing the chances for a meaningful retest of the low. Accordingly a detailed collar suggestion for SPY using Advanced Options data follows a short market review. S&P 500 Index (SPX) 2707.88 added 1.35 points or +.05% last week, including Friday's reversal day closing 1.83 points or +.07% higher. Last week could have been labeled "Target 200" as resistance at the 200-day Moving Average became an ideal place for profit taking. Now look for support from the operative downward sloping trendline from the October 3 high around 2650. 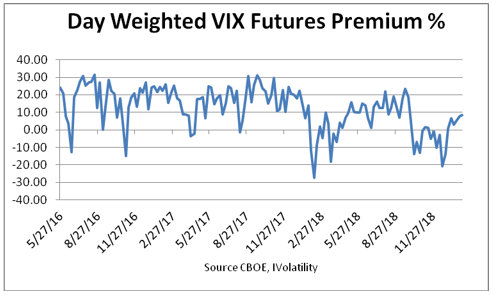 With 2 trading days until February expiration , the day-weighted premium between February and March allocated 10% to February and 90% to March for a 8.26% premium vs. 7.54% the previous week ending February 1. Well below the bottom of the green zone between 10% to 20%, it continues suggesting cautionary positioning unconvinced the SPX advance will continue without an attempt to retest the December lows that may have just begun. 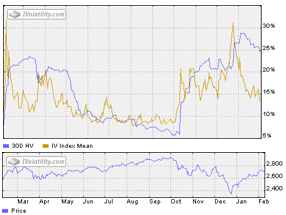 Relative to the 30-day historical volatility at 15.89% (calculated using the annual rate of change method ) that has declined from 25.15% the prior week, both the mean call implied volatility index (IV Index %) at 12.90% and the put implied volatility index at 12.86% suggest options are reasonably priced compared to a month ago. The next section with the graphs require considerable explanation so they will be saved for another time, but some information is provided in the "Companion Guide." Since the next monthly expiration will be Friday February 15, going out to March 15 for this trade plan allows more time. SPY has weekly options many so other expirations could be used. The available selections are in this next section with explanations at the ? marks. Once again details are provided at the blue ? marks. Results are .10 debit, -.8607 negative delta, with the other Greeks mostly offsetting, where ? = delta, G= Gamma (rate of delta change), T = Theta (time decay), V = Vega (implied volatility change). For a small debit about 86% of the long ETF risk can be hedged. By selecting other strike prices the debit amount and Greeks will change. The trade plan should also consider adjustments when the price of SPY changes beyond the selected strikes. Since the objective of this plan was to hedge some portion of a long position should SPY quickly decline to the lower strike near 268 a vertical put spread would add additional downside protection. For example, long a 268 put and short a 260 put. Typically collars are used to protect gains already made by the stock or ETF, an alternative is to just sell the 272 call for a 3.78 credit an create a covered call. All the data needed for vertical spreads or any other combination are available in Advanced Options . Next week an expanded market review will include a breath update along with selected other Foremost Indicators. Good knowledge based artical for Monthly option, same applies to weekly option ? Thanks for the comment. Sure the same applies to weekly options, but Theta, the rate of price decline as expiration approaches is much more critical. Selecting the optimal time period remains the most important decision and often determines the best options strategy. Consider longer time to expiration for long directional strategies and perhaps hedges while short option strategies benefit from greater time decay.